In LET'S PRETEND THIS NEVER HAPPENED, Jenny Lawson baffled readers with stories about growing up the daughter of a taxidermist. 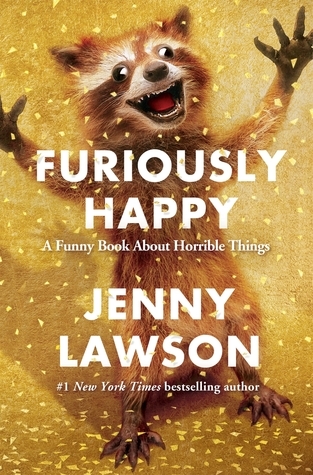 In her new book,FURIOUSLY HAPPY, Jenny explores her lifelong battle with mental illness. A hysterical, ridiculous book about crippling depression and anxiety? That sounds like a terrible idea. And terrible ideas are what Jenny does best. All I can say is "Pinata Stupid Stake." "Be bizarre. Be weird. Be proud of the uniquely beautiful way that you are broken." "He looked like he was the most excited member of your surprise party, or like a Time Lord in the process of regenerating." "That's why you have to rely on friends and family and strangers to help you when you can't help yourself." Ha ha -- You gotta love a book that makes you more empathetic toward your customers, especially during the holiday madness. Seriously, though, books that make me empathetic toward other people, especially those who are drastically different than me, are the best.